I'm not a regular van driver, but I do enjoy driving a Transit - and when our bright orange Transit Custom Sport arrived, I was very keen to get behind the wheel. A house move gave me the perfect excuse to borrow the keys from Dan for a weekend (it's a bit more practical for such purposes than my Volkswagen e-Golf). It's surprising how much rubbish you can acquire in a one-bedroom flat, but I was also surprised how well the Ford Transit Custom Sport swallowed it. While it doesn't look like a big van, you can get an awful lot of boxes in the back. Loading was easy, too, thanks to its large opening tailgate as well as a sliding side door. I was moving 50 miles north up the A1 - a very tedious journey with nothing but roadworks and the occasional roundabout to break it up. Over the space of one weekend, I did the return journey more than half a dozen times, meaning I had plenty of time to bond with the Transit. I really like how easy it is to drive. You sit high up, obviously, giving you a good view of the road ahead. Gadgets like the rear-view camera and Blind Spot Monitoring make life much easier, as does the £500 adaptive cruise control. In fact, I'd almost go as far as saying cruise control is a must-have option if you're not used to the lower speed limits that apply to vans on certain roads. This is what a one-bed flat packed into a Transit looks like. With the van fully-loaded with my worldly possessions, I can't say I noticed a big difference in how the Transit drove. The brakes might have needed a bit more pressure, but they're on the grabby side when empty, and I resisted the temptation to chuck it around roundabouts. Fuel economy was late 30s - pretty good with a full load, considering its official 44.1mpg. Most of the time I sat at 60mph up the A1 and it felt like it had plenty of performance left should I have wanted to go faster. Criticisms? The wheelarches eat into luggage space slightly - but find me a van where they don't. And I'm not sure I'd go for orange with the black decals. Oh, and I'd prefer an automatic gearbox for the ultimate in upmarket long-distance load lugging. These minor points aside, the Transit Sport took a lot of the hassle out of moving house. In fact, I'd even go as far as saying I'd happily drive it every day. In the city the Transit Custom shows its quality, even if its lights don't always light the way. Our van feels more like a large family car than a commercial vehicle on the road, which makes long trips a breeze. Andrew borrows the Transit Sport to move house. How good is it at carrying worldly possessions? Comfortable, calm and packed with useful features, the Transit Custom Sport has everything a van driver needs. 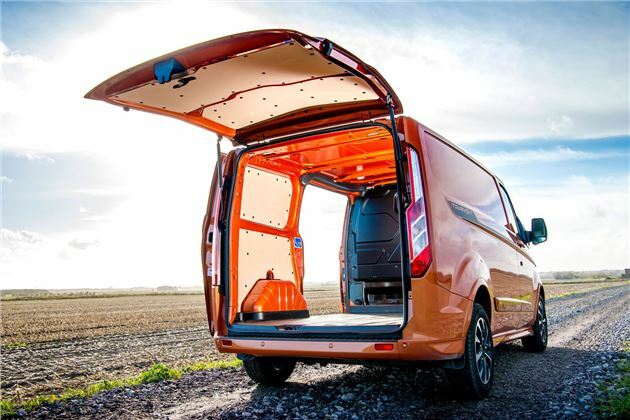 Three month review of the Transit Custom Sport, how will Ford's flagship van perform?